Digital temperature measurement instruments supplied by The Measurement Shop UK. The thermometers we offer feature large LCD displays for easy and effective monitoring of area or a sample's temperature in Celsius, Kelvin and Fahrenheit units. Our temperature measurement devices utilise a compact, portable design that can be used in a wide variety of industries, including medical, pharmaceutical, automotive, education, and the food industry. 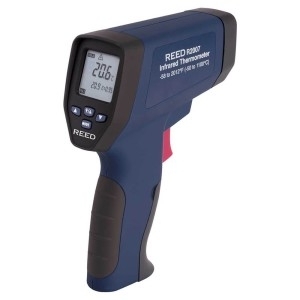 Choose from a selection of top-quality infrared, Type K, dual laser and thermocouple thermometers produced by leading Canadian manufacturer, Reed Instruments. If you require any help choosing a product to suit your requirements please contact us. 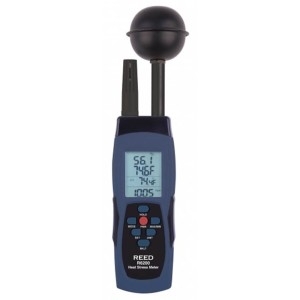 What are temperature measurement meters used for? Medical and pharmaceutical - Digital thermometers are used for monitoring the temperature of chemicals, cell samples and solution storage units. Education - For taking the temperature of heated solutions when using a Bunsen burner in school classroom experiments. Food industry - For checking the temperature of food storage units such as fridges, freezers and ovens to ensure preserved food adheres to health and safety standards. Automotive - For checking the temperature of engine oil, coolants, lubricants and other chemicals.